#TSPSC #Departmental #Tests Notification 2018 - November 2018 Session Exam schedule - Notification No.65/2018 Exam time table: As per the Public Service Commission Regulations, Telangana State Public Service Commission conducts Departmental Examinations for employees working in various Departments under State Government of Telangana. The Commission conducts Departmental Examinations twice a year i.e., in May and November for the promotions to the employees. The Departmental examinations are held at ten (10) District Headquarters including Hyderabad. The candidates are admitted to the District Centre concerned where the candidates are presently working. TSPSC Departmental Tests November 2018 Session Notification has been released on 13-12-2018. This notification details as follows. The Telangana State Public Service Commission will conduct the Departmental Tests Examinations (Objective Type) vide Go.Ms.No.602 GA (Ser-C) Department, Dt: 01/11/2011 and few Tests are written examinations as mentioned under Para 5 (h) at (10) District Head Quarters and in Hyderabad for November 2018 Session as per the Time-Table shown in accordance with the terms and conditions as laid down in Departmental Tests Rules, 1965 and as amended from time to time. The Candidates are instructed to pay an amount of Rs. 50/- towards application fee in addition to the Examination fee of Rs.50/- for each paper. Application Form, Time-Table and other details are available in the Commission’s Website http://www.tspsc.gov.in Applicants shall apply the Departmental Test for November 2018Session examinations through ON-LINE ONLY. Departmental Examinations for November-2018 Session will be held from 10-02-2018 to 16-02-2018 at (9) District Head Quarters of Telangana state including Hyderabad District. The candidates may apply online for the same from 18-12-2018 to 08-01-2018. For details and other necessary information, the candidates are instructed to go through the Notification carefully which will be available on the Commission’s official web-site www.tspsc.gov.in from 16-12-2018 onwards. The candidates are instructed to read the notification thoroughly before applying. For any details and clarifications the candidates are advised to visit commission’s Official web-site. Handwritten /Typed /Photostat /Printed application forms will not be entertained. (i) Only the employees working in the respective departments of Telangana State are eligible to apply for the tests mentioned below. However, Secretariat employees wherever the rules permit are allowed to appear for any Departmental Test in order to get eligibility for appointment by transfer/ promotion to other Services, on payment of the prescribed fee. b) Treasuries and Accounts Department: Paper Code No: 31,46,64,79,89,100,114 and 129. N.B: The respective Service Rules should be referred to by the candidates for deciding the eligibility or otherwise to apply for the Tests. (ii) The following Tests bearing Paper Code numbers are open to all, whether the applicant is in Government Service or not. Paper Code No. 5, 8, 10, 18, 19, 27, 28, 36, 43, 45, 49, 62, 67, 77, 98, 108, 127, 136, 137, 141, 142, 144 to 148 and 155. (iii) Other Tests can be written by any Government Servant, whether working in the same Department or not those who have already passed the test should not apply again. if any such case comes up to the notice of the commission, he/she is liable for severe disciplinary action by the department besides cancellation of the test passed second time by him/her. (i) a) The fee payable for each paper mentioned in the Time-Table of this notification shall be Rs. 50/- (Rupees fifty only). However, no fee is prescribed for the Tests in Gujarathi and Marwari Languages. The fee once remitted, shall not be refunded or adjusted under any circumstances. Failure to pay the examination fee, application fee will entail total rejection of application. As per existing Rules(combined A.P), Government removed all fee exemptions vide G.O.Ms.No. 360, General Administration (Services-C) Department, dated: 16/08/2002. The list of Banks providing service for the purpose of on line remittance of fee is given in notification. ii) IPOs / Demand Drafts are not accepted. I Step: The Candidate has to logon to the WEBSITE (www.tspsc.gov.in) and enter his/her necessary details like Name, Father's Name, Date of Birth, and papers to be applied. II Step: Immediately on entering the above details the Applicant will get Challan Form to pay the Fee at State Bank of India /TS Online centers. III Step: The Applicant should pay the prescribed Fee in any one of the State Bank of India /TS Online centers and obtain Fee paid challan with Journal Number in the first instance. IV Step: On the next working day after payment of Fee the Applicant should again visit WEBSITE and enter the Journal Number details to get the format of Application. The applicant has to invariably fill all the columns in the Application and should submit ON-LINE. V Step: Those candidates who need assistance of Scribe are requested to apply for the same directly to the Commission on or before 10/03/2018. They should mention the Application ID Number and enclose Copy of the Medical Certificate along with a representation. VII Step: Candidates who are writing the examination in objective Type are advised to hand over the original OMR sheet to the invigilator and can take carbonless OMR sheet copy along with them. a) Candidate applying for "Departmental Test for Mines and Geology" should furnish the period of service completed in the Application Form. Senior Assistants working in the Offices of Director of Accounts in Projects and Accounts Branches of the Divisions of the P.W.D. (R&B), Irrigation Branch, Public Health Engg. Department and Panchayat Raj Engg. Department and Ports Department who have been working as such for a period of three years or more are allowed to appear for this examination. Superintendents working in the above Departments are also allowed to appear for the examination. Senior Assistant/ Superintendents working in the Divisions of P.W. Engineering Departments i.e., State Government Employees are only eligible for appearing Divisional Test. They should download and fill the service certificate which is available in the Commission's Website showing the service rendered in the Category of Senior Assistant in Engineering Department and get the signature with Seal of the Controlling Officer of parent department as per the particulars shown in their Service Register. The Service Certificate duly signed by the Controlling Officer should be scanned and uploaded. Otherwise their applications will be summarily rejected. Local Body Employees may also apply for this Test. But their admission is provisional, subject to their eligibility as per G.O.Ms.No. 86, Finance & Planning (FW.WA-1) Department, dt. 22/05/1998. Commerce graduates who claim exemption from passing Paper-I of Part-I of Divisional Test should furnish information in the Application Form. Failing which, their Applications are not considered for exemption of Paper-I of Part-I of the Divisional Test. c) Candidates appearing for Fisheries Department Test-II should furnish the information regarding satisfactory completion of training from the State Fisheries Training Institute, Kakinada in the Application Form. d) Candidates appearing for Criminal Judicial Test with Law Qualification should furnish the information in the Application Form to seek exemption from passing Paper-I & II of the above Test, failing which their Applications will not be considered for exemption from passing Papers I & II of the Test. e) Candidates appearing for Sericulture Department Test, Part-III (Paper Code No. 154 - Practical Test) must pass Part - I of the Test consisting 4 papers and that they are required to furnish the information in the Application Form. f) All papers of objective type 2 hours only. g) Language Test paper code No.5,6,7,19,28,37,49,67,36,58,74 and surveys & Settlement 69,87,109,118,110,119,111,120,112,121,116,133,117,134,122,135 (written exam) is in conventional Type. h) The duration of tests of objective type & descriptive type pattern is as per the G.0.Ms. No.288, GA(Ser. c) Dept., dt:1O/09/2014. 1) Candidates according to Para-5(b) & (c) of the Departmental Tests Notification are only eligible, other than Department candidates are not eligible. If candidates applied other than Department liable for rejection and also debarment. 2) Certifying officers have to verify the records whether he/she has been completed 3years of minimum service in the category of Sr.Asst. 1. If the Photo/ Signature uploaded is not clear. 2. If prescribed fee is not paid and/or if fee paid is less. 3. If fee is not paid towards application. 4. If the Service Certificate is not filled/ not signed by the Controlling Officer/ without seal of the Controlling Officer/ signed by the candidate himself/herself (self attestation) instead of his/her Controlling Officer/signed by the Gazetted Officer instead of their Controlling Officer. If not uploaded the Service Certificate. 5. If the filled in Application Form is not in terms of this notification. 6. If the applicant is not eligible to appear for the Test in terms of Para(3) of the Notification. 7. If the candidate applies during debarment period. (i) All the departmental tests, except “departmental test for the Staff of tspsc, divisional test& departmental test for t.s. Works accounts service” will be held at all the “09district head Quarters” " including Hyderabad city", which is common capital. 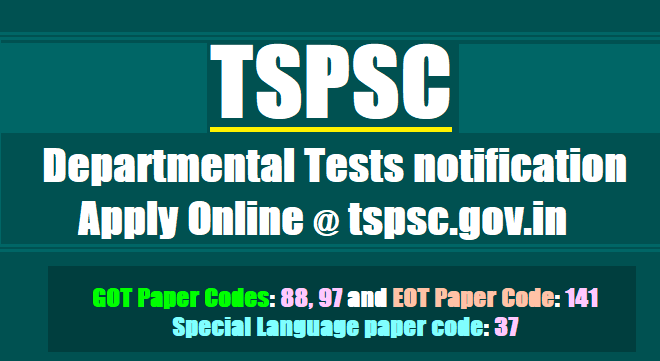 The departmental test for the staff of tspsc, divisional test & Departmental test for t.s. works accounts service will be held At Hyderabad centre only. (ii) The Departmental Tests examinations will be held at (9) District Head Quarters and also at state common capital Hyderabad as mentioned below. The candidates are admitted to the District Centres where the candidate is presently working as mentioned in the application. పబ్లిక్ సర్వీస్ కమిషన్ నిర్వహించే డిపార్టుమెంటల్ పరీక్షలలో Spl.Language Tests Telugu,Hindi,Urdu ఎవరు రాయాలి? 👉ఇంటర్మీడియేట్ ఆ పై స్థాయిలో తెలుగు ఒక భాషగా చదవనివారు Spl.language Test in Telugu(P.code-37) రాయాల్సి ఉంటుంది. 👉10వ తరగతి ఆ పై స్థాయిలో హింది/ఉర్దూ ఒక భాషగా చదవని వారు Spl.language Test in Hindi/Urdu రాయాల్సి ఉంటుంది. తెలంగాణ ప్రభుత్వ శాఖపరమైన పరీక్షలు (Departmental Tests) నోటిఫికేషన్ విడుదల చేసిన నేపధ్యంలో అసలు డిపార్టుమెంటల్ పరీక్షలు ఎవరు రాయాలనే సందేహం చాలామంది ఉపాధ్యాయుల్లో ఉంటుంది. దానిపై కొంత వివరణ మీ కోసం అందించే ప్రయత్నం చేస్తున్నాము. అప్రయత్న పదోన్నతి పథకం(AAS) లో భాగంగా SGT క్యాటగిరి ఉపాధ్యాయులు 12 సం ॥ స్కేలు పొందుటకు GOT&EOT పరీక్షలు ఉత్తీర్ణులు కానవసరం లేదు. కాని 24 సం॥ స్కేలు పొందుటకు ఖచ్చితంగా GOT&EOT పరీక్షలు ఉత్తీర్ణులు కావాలి.ఎటువంటి మినహాయింపు లేదు. స్కూల్ అసిస్టెంట్ తత్సమాన క్యాటగిరి ఉపాధ్యాయులు 12 సం॥ పొందుటకు GOT&EOT పరీక్షలు ఉత్తీర్ణులు కావాలి. స్కూల్ అసిస్టెంట్ లు గజిటెడ్ ప్రధానోపాధ్యాయుల ప్రమోషన్ పొందుటకు GOT,EOT పరీక్షలు ఉత్తీర్ణులు కావాలి. సర్వీసలో ఒక్క ప్రమోషన్ కూడా తీసుకొనివారు 45 సం॥ వయస్సు దాటితే ప్రస్తుతము పనిచేయుచున్న క్యాటగిరి నుండి పై క్యాటగిరి కి ఎటువంటి శాఖాపరమైన పరీక్షలు ఉత్తీర్ణత పొందాల్సిన అవసరం లేదు. 50 సం॥ పైబడినవారు ప్రమోషన్ కొరకు ఎటువంటి శాఖాపరమైన పరీక్షలు ఉత్తీర్ణత పొందాల్సిన అవసరం లేదు. ఇంటర్మీడియట్ ఆ పై స్థాయిలో తెలుగు ఒక భాషగా చదవని ఉపాధ్యాయులు (Higher Standard) వ్రాయాలి. పదవ తరగతి ఆ పై స్థాయిలో హిందీ/ఉర్దూ ఒక భాషగా చదవని ఉపాధ్యాయులు (Lower Standard) వ్రాయాలి. డిపార్టుమెంటల్ పరీక్షకు హాజరయ్యే ఉపాధ్యాయులకు OD సౌకర్యం ఉంటుందా? ఫండమెంటల్ రూల్ 9(6)(b)(iii) ప్రకారం నిర్బంధ శాఖీయ పరీక్షకు(Compulsory) హాజరగుటకు ఎన్నిసార్లైనా OD సౌకర్యం కల్పించవచ్చును. అయితే ఐచ్చిక పరీక్షకు(OPTIONAL) హాజరగుటకు రెండుకంటే ఎక్కువసార్లు OD రాయితీని ఇవ్వరాదు.